A pivotal moment in the legend of Rome’s founding fathers, Romulus and Remus, is when the brothers are saved (and weaned) by a lupa – a she-wolf – from the brink of starvation. The event is depicted by the Capitoline Wolf, where the twins’ mouths reach desperately towards the teats of the beast in search of nourishment. 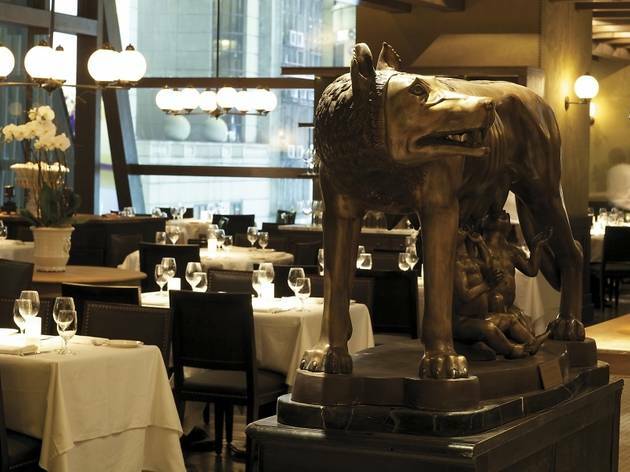 There is a replica here at Lupa; an apt representation, perhaps, of the starved anticipation that preceded chef Mario Batali’s first restaurant in this city. 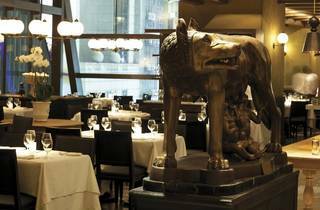 While the original Lupa is an upbeat Roman trattoria in downtown NYC, this particular wolf is tamed by its third-floor location in the high-gloss LHT Towers. It’s got a lot going for it otherwise – high ceilings, curved banquettes, toosh-cradling leather seats and handsome dark wood furniture (the more casual La Terrazza section is more low-key and serves pizzas and fritti). Service is also pitched perfectly – friendly enough, but never veering into that terrible first-name over-familiarity so favoured by our American cousins. This casual feel is reflected in the menu, with a broad mix of antipasti, starter-sized pastas (most of which are made in-house) and meaty secondi. Wines are reasonably priced with a carafe of grignolino coming in at $110, and a number of bottles hovering at the $300 mark. Of the antipasti we try though, few merit a return visit: house-cured baccalà ($108) is devastatingly salty, even for salt cod, while thinly-sliced squash with pecorino ($48) is one-note and watery. Plump mussels with peperonata and mint ($98) is the best of the lot, while a tangy caponata ($48) with sweet-sour aubergine runs a close second. Moving on to bigger plates, the classic Roman dish of veal saltimbocca ($298) is golden and juicy, but again aggressively salted. Corzetti with rabbit ragu ($178) is lighter than expected, with sage-scented strands of tender meat draped across the Ligurian coin-shaped pasta. This dish comes with a disclaimer: the pasta is cooked a level-up from al-dente, which may be too underdone for some, but we love the contrast between the soft ragu and firm corzetti. 3/F, LHT Tower, 31 Queen’s Rd, Central, 2796 6500. Daily noon-3pm & 6pm-11pm. Dinner for two: around $1,200.